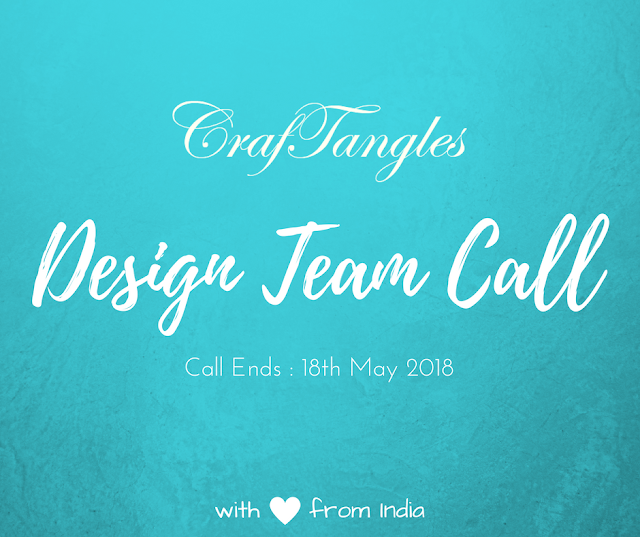 I'm back with more projects made with the newly released Craftangles stamps and stencils!! 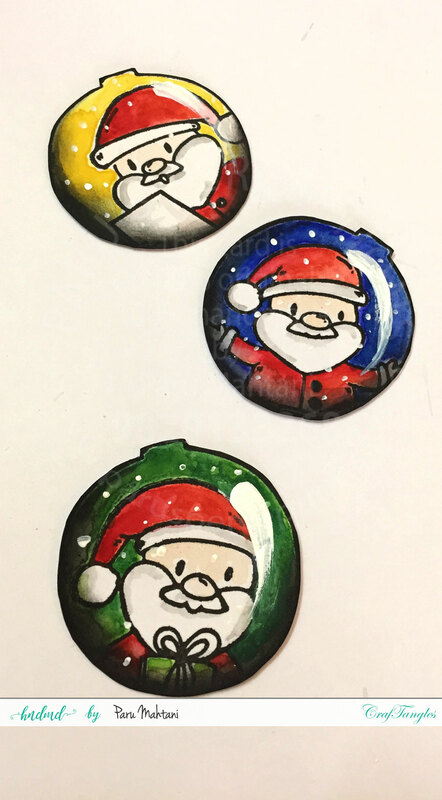 First off, I have the baubles from the Craftangles 'Christmas Ornaments' stamp set which I coloured using the technique demonstrated by Sandy Allnock. They are far from perfect, but I like the way they turned out! 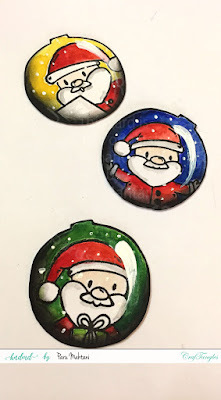 I used the bauble outline and stamped the Santa's from the Craftangles 'Santa Claus' stamp set inside them. I then watercoloured them and fussy cut them. I then used a sponge dauber and tim Holtz black soot distress ink to darken the edges to give some diemnsion. I then used white acrylic paint to create the highlight. Sandy recommends a white gel pen, but mine wasn't working properly so I had to improvise. I added the snow dots with white acrylic paint too. 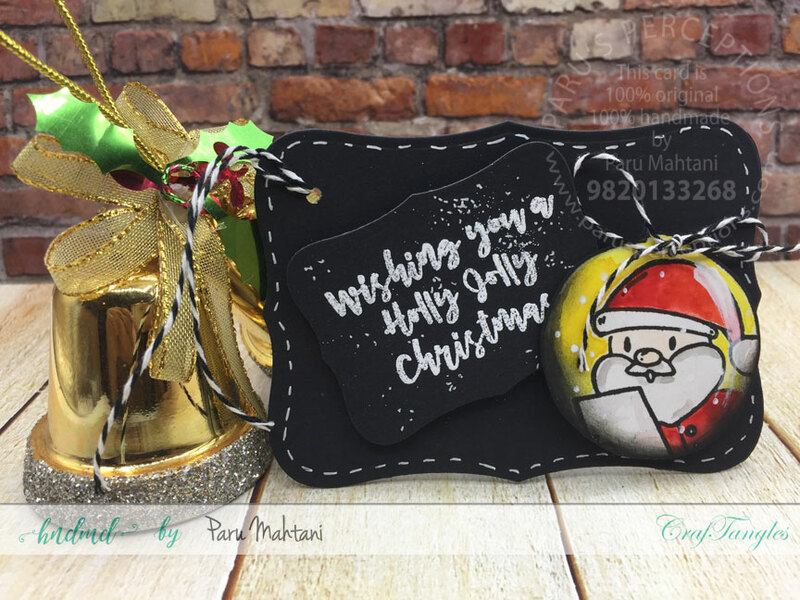 First one I used on a black tag..chalkboard effect..
the Craftangles 'Holly Jolly Christmas' stamp set. Craftangles 'Christmas Ornaments' stencil to create a background on white card stock and white heat embossed the sentiment from the Craftangles 'Holly Jolly Christmas' stamp set on balck cardstock to finish the card. Craftangles 'Santa Claus' stamp set. I then adhered it to the card using an Action wobble. I had to trim the Action wobble to fit behind the Santa. and popped it up with some 3D foam tape. I added some Craftangles sequins and adhered the panel to a kraft card base. Check out the video below to see how Santa wobbles! This next card is a shaker card. Craftangles 'Bearing Gifts' stamp set. I love this rolling bear!! There is so much movement in this image. So I decided to make him frolic in the snow! Craftangles 'Ivory hearts' and silver sequins. I tore a few panels of white card stock and layered them to create the effect of snow banks. 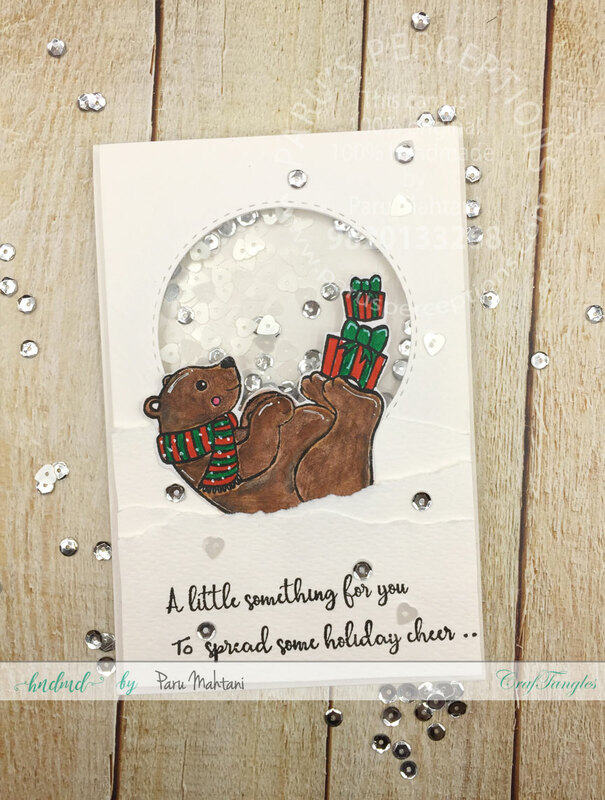 I inserted the bear cut out (stamped, watercoloured and fussy cut) and added the sentiment, also from the Craftangles 'Bearing gifts' stamp set. 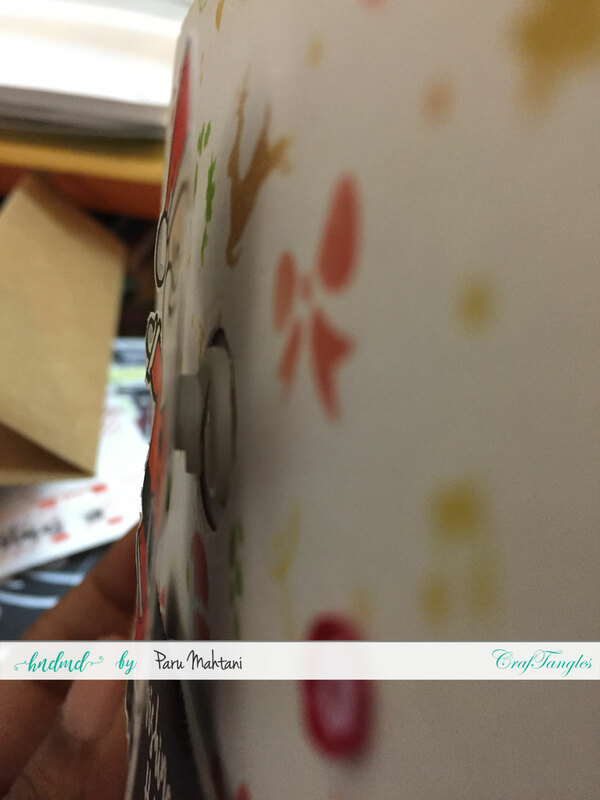 I finished the card by adding some of the same sequins on the outside and adhering the shaker panel to a white card base. For the final card, I used the Craftangles 'plaid' stencil to create the background as well as the circular spinner chanel. I diecut the spinner chanel using the Queen and company circular frame die. 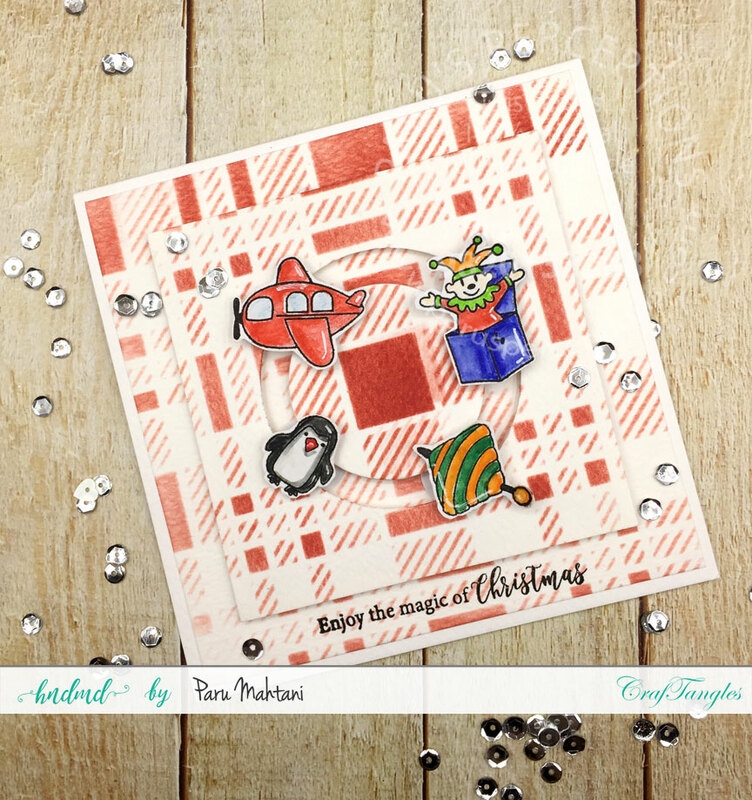 I stamped, coloured (with Steadler watercolour pencil) and fussy cut the toys from Simon Says Stamp 'Christmas Toys' stamp set and added them as cute little spinner elements on the card. I added the sentiment..also from the same stamp set and some sequins to finish the card. Im linking up this card to the Simon Says Stamp 'Christmas Card Day' challenge. 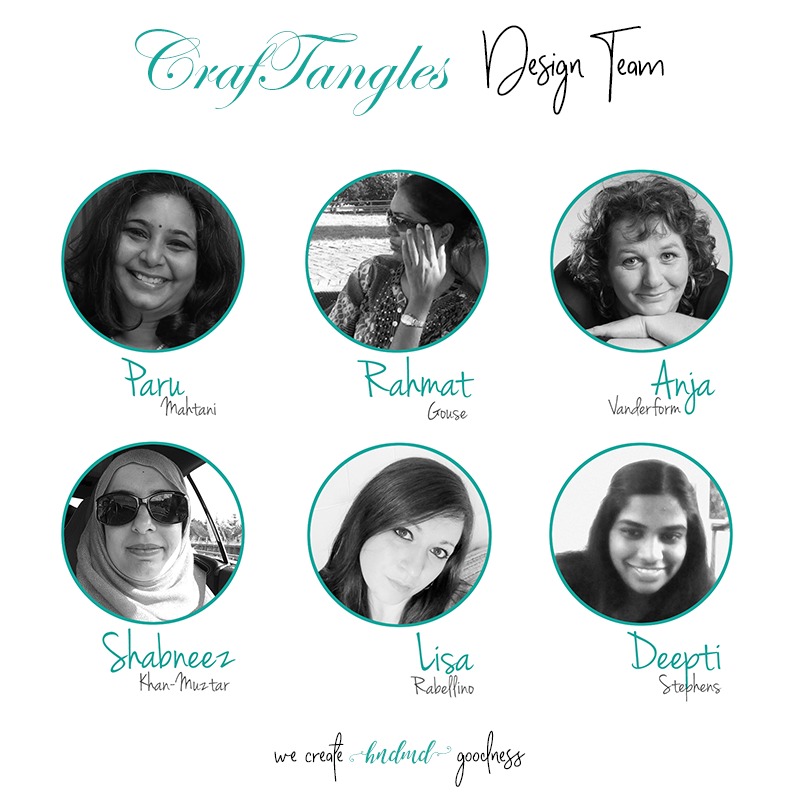 I have really enjoyed making these interactive cards for you today! 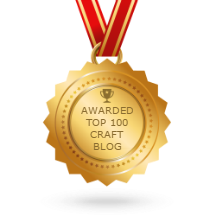 I hope I have inspired you to make some too! 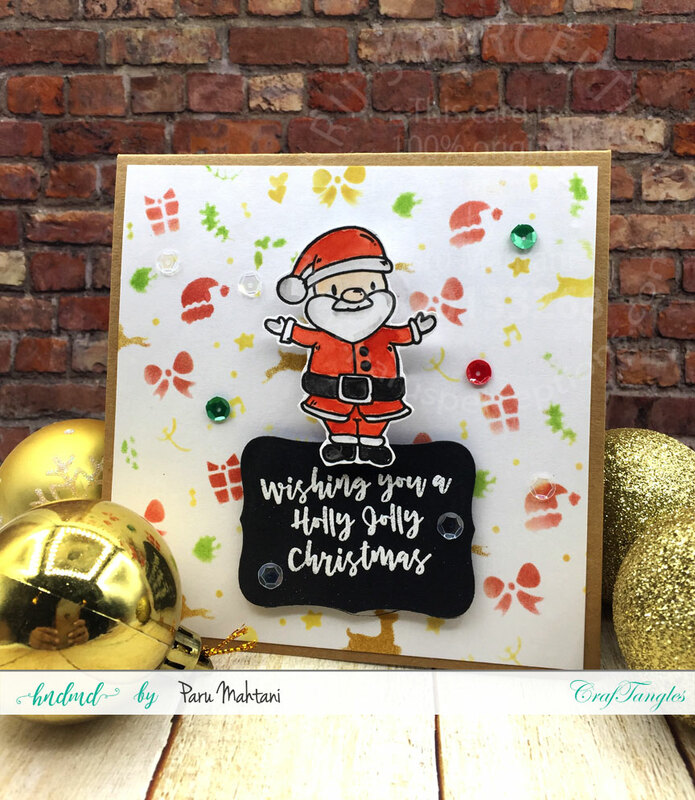 Do check out Paru's Cardmaking Challenges 'Christmas' Challenge this month! 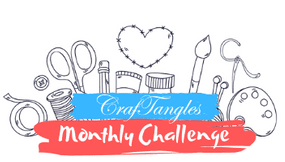 We have an awesome goodie bag to give away as a prize to the winner of the challenge! What a fantastic collection of cards Paru! Love the interactive elements, these are going to be a success with children and adults alike!